It is generally accepted that eCommerce started on the web in 1996. 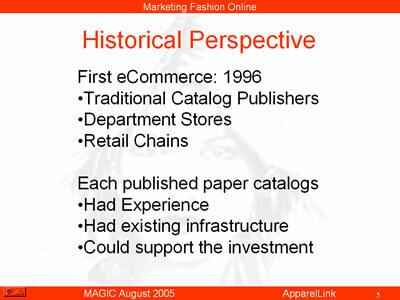 The first to adapt the web to their existing Fashion Retailing business model were the established catalog publishers as well as department stores and retail chains with catalog businesses. These were successful marketers that knew how to present attractive images in ways that generate sales. They had existing infrastructure that could service online sales in the exact way that they were supporting their paper catalogs. Although moving to the web in the early years was very expensive, they knew they had to stake out their online territory. They had an existing customer base with which they had already established credibility. Their greatest challenge was to get their customers to trust shopping online.